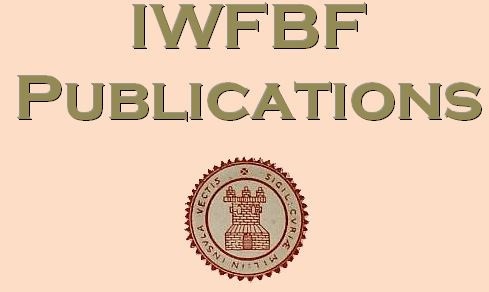 All of the IWFBF publications below are easily accessible to order by clicking on the hyperlink below which will take you direct to Damon Corr's publishing page of the Blurb website. All publications are available in either paperback or hardback (image-wrap) to suit your preference and budget. Where stated, some can also be downloaded for far lesser cost as a file compatible with Kindle Fire devices or Apple iPad. The profits from all IWFBF publications are forwarded to the Firefighters Charity. Non-IWFBF publications that do not contribute to the Charity will be stated in the description and are located separately at the bottom of the page. Thank you for your interest in the Federation and support of the Firefighters Charity. Many people have asked me why I use the Blurb publishing service. I appreciate that books from Blurb are generally priced higher than comparable publications found in High Street stores and that each purchase attracts an unwelcome post and packaging fee. *Firstly I have great faith in Blurb's production quality and their freely available software allows me to not only produce the content but have complete control over the layout and overall appearance of every page of every production. *The Blurb philosophy enables people that have something to write to reach their intended audience without being scrutinised commercially by third parties with no interest but profit. *Blurb allows me to set a constant profit per purchase that creates funds for the Firefighters Charity. Although Blurb's base cost may fluctuate with the availability of materials and production costs, the donation to the Charity per purchase remains constant. *The only investment by me is the time, effort and personal cost in researching and writing the content of each publication. This began as a hobby that I've utilised to assist the Charity who assisted me when I needed them. I am not a businessman, I'm a firefighter. *Nowhere in the world is there a row of shelves loaded with my books awaiting order and distribution. There is therefore no risk of capital investment by me or others and no unnecessary waste of production resources and materials. Every book ordered is a bespoke item which is unfortunately reflected in the cost but ensures my dealings in the commercial world are as clean and waste free as they could possibly be. A good friend of mine who is a successful businessman once suggested to me that there could be a commercial success in adopting a different approach. I don't doubt him for one second as he knows his field, but it's not mine and I don't want an enthralling hobby with a philanthropic objective to be overshadowed by commercial pressures. I hope you appreciate my reasons and I apologise that this dictates a greater cost to you as the buyer but please do so in the knowledge that by buying you are helping members of the fire and rescue service family and at the same time not supporting mass production and waste. 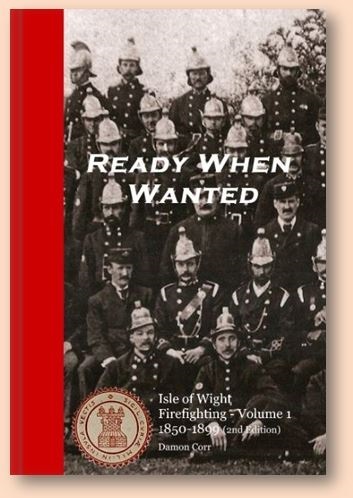 The first volume of Isle of Wight firefighting history was the culmination of many years of research and literally thousands of items from which to create an entertaining, educational and at times comical look at the Island's firemen, the political mood that affected them and the incidents they attended in the mid to late Victorian era. The first printing was available from November 2017 until March 2018. A second edition, with some amendments, and to be frank some production improvements is now available in the new cover seen on the left. The plan for the cover change is that a person building up the collection of the books will place them side by side on a shelf and the spines will represent the central colour scheme of the Long Service and Good Conduct Medal Ribbon. This is the first example of a range of IWFBF research publications covering a broader field. This edition is NOT centred on locations or persons connected with the Isle of Wight. 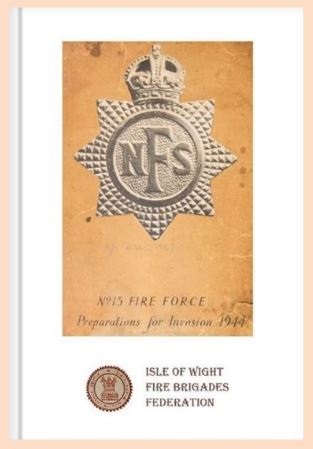 However during research in to the possibility of Isle of Wight firemen being connected with the NFS Overseas Contingent, I discovered the implications of the Colour Scheme, which redeployed NFS resources to areas of greater risk during the build-up of resources and personnel in preparation for D-Day. No. 15 Fire Force - Preparations for Invasion is the story of our neighbouring Fire Force's key role in the Colour Scheme reinforcing programme and adds to the wider understanding of what was happening within the NFS in later 1943 and 1944 which would undoubtably, with regard to the Isle of Wight's strategic and geographic position in the preparations for D-Day, have similarly affected our local NFS units. 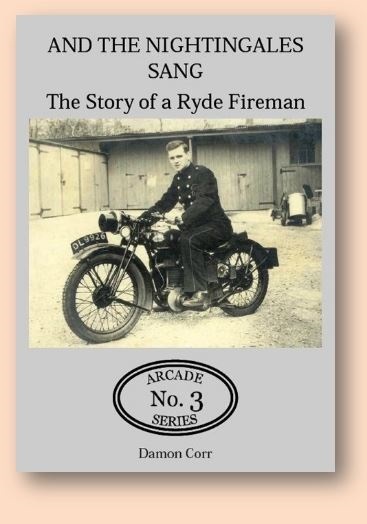 Colin Weeks was the teenaged son of the Mayor of Ryde when he joined the local section of the Auxiliary Fire Service (later the National Fire Service, Region 6, Fire Force 14d) initially as a clerk to assist Chief Officer Max Heller. During his service he kept a diary of events, some of which make uncomfortable reading as they involve unimaginable happenings within the streets and places that today's residents know so well. There's also a hint of the writer's irreverant humour and examples of the kind of banter that all who've spent time in service with others will find familiar. The diary was to end very suddenly. Years of painstaking research uncovered the reason. 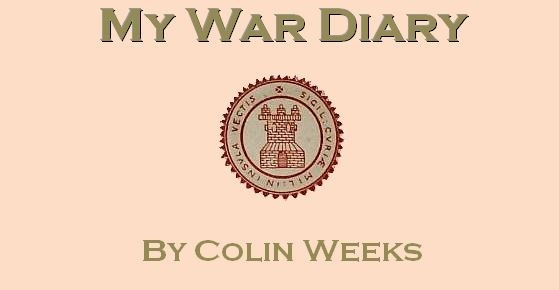 Damon Corr introduces and closes this reproduction of Colin's war diary. 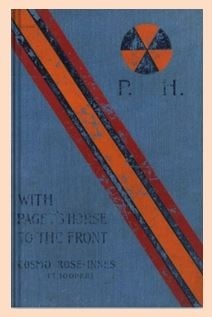 With Paget's Horse to the Front by Imperial Yeomany Trooper Cosmo Rose-Innes follows the author's adventures during the Second Boer War in South Africa. To find out why reproducing this aged publication was of interest and how it relates to a fascinating character of Isle of Wight society, please take a look at the first article submitted in the IWFBF's Military Interest Section... To The Stars. In 2009 I wrote a booklet as a fundraiser, one of a series of local history productions in order to assist the Historic Ryde Society. 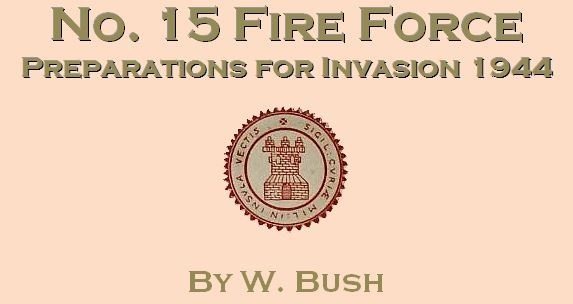 Although further information has been discovered in subsequent research, this booklet stands as a fair description, from one fireman's perspective, of the events before, during and after the infamous Cowes Blitz of 4/5 May 1942. 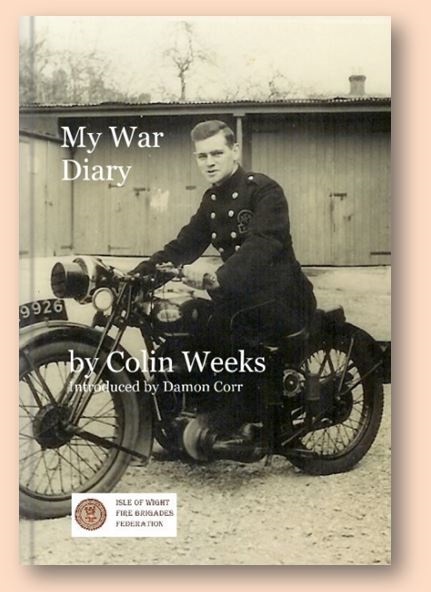 Still available from the Society's website for a nominal cost it may be of interest to those that read Colin's diary and wish to know more. Click on the link to the Historic Ryde Society above to access their online shop. Note; this is not an IWFBF publication, profits from sales are those of the Historic Ryde Society. ; Registered Charity No. 1153947.